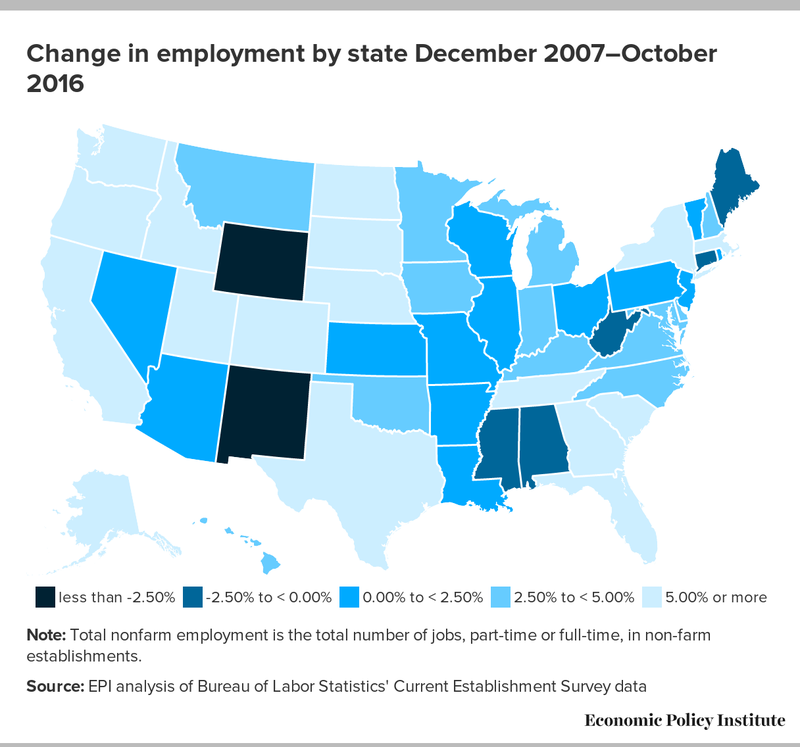 The October State Employment and Regional Employment data, released today by the Bureau of Labor Statistics, show state labor markets have mostly continued their trend towards economic recovery. Over the last quarter, a majority of states have seen job growth, no change in unemployment rates, or only slight employment declines, along with increases in the labor force participation rate. These indicators point to healthier labor markets for current workers and preciously discouraged job seekers reentering the work force. From July to October, 34 states and the District of Columbia added jobs, with the largest percentage gains in District of Columbia (+1.1 percent), New Hampshire (+1.0 percent), Tennessee (+1.0 percent), and Washington (+1.0 percent). Over the same period, 16 states lost jobs. Maine (-1.3 percent), Vermont (-1.0 percent), and New Mexico (-0.9 percent), and Connecticut (-0.8 percent) suffered the largest losses. Over the last quarter the Northeast was the only region to experience job loss, but this loss has not been sustained over the past 6 or 12 months. From July to October, the unemployment rate fell in 17 states. 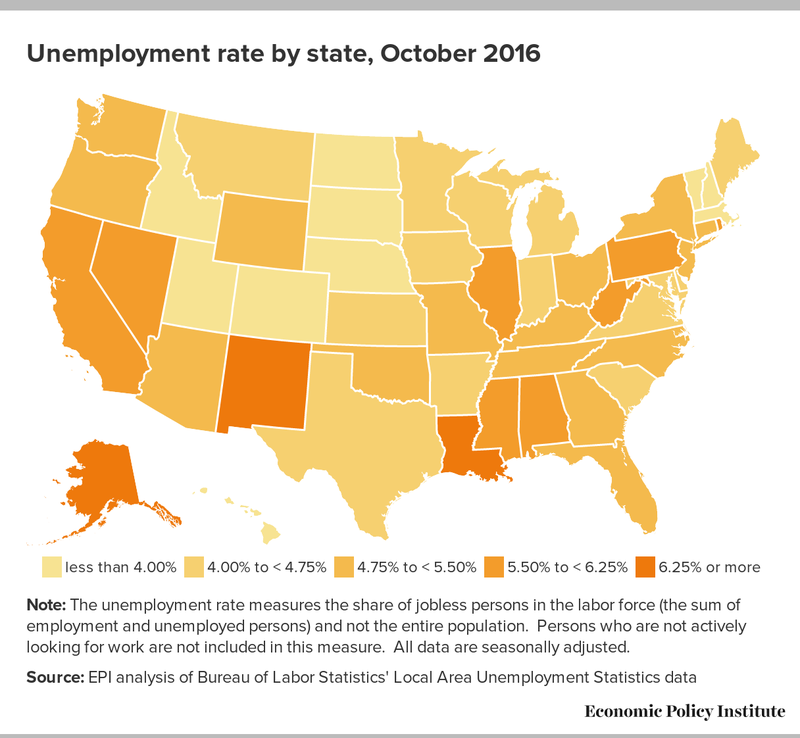 Nevada (-1.0 percent), Arizona (-0.8 percent), Massachusetts (-0.8 percent), and Utah (-0.7 percent) experienced the largest declines in unemployment. There were small increases in the unemployment rate in 24 states and the District of Columbia. The largest increases in unemployment rates occurred in New York (+0.5 percentage points), Tennessee (+0.5 percentage points), Virginia (+0.5 percentage points), Kansas (+0.4 percentage points), and Missouri (+0.4 percentage points). Twenty states still have higher unemployment rates than at the beginning of the Great Recession. As the labor market continues its slow but steady recovery, policymakers should make sure the rewards of economic growth are shared by those demographics usually left behind. Federal and state institutions can address gender and racial disparities through a number of policies including progressive revenue increases, a higher minimum wage, and pay equity for women and minorities.